The Robin's Nest was really generous in providing us with paper, card bases, embellishments and Dew Drops. In addition to a wonderful assortment of Dew Drops, I received their Vintage Card Kit. I had a hard time deciding which items to use for this project. I started with a cardstock base and selected one of the cards, a silver swirl and some Dew Drops from the Robin's Nest kit. To add to that I found a coordinating sheet of stickers from my stash and a herringbone-striped vellum. I used the Best Glue Ever along with Embellie Gellie to easily adhere the Dew Drops -- the Embellie Gellie lets you pick up the Dew Drops and set them in the flower. 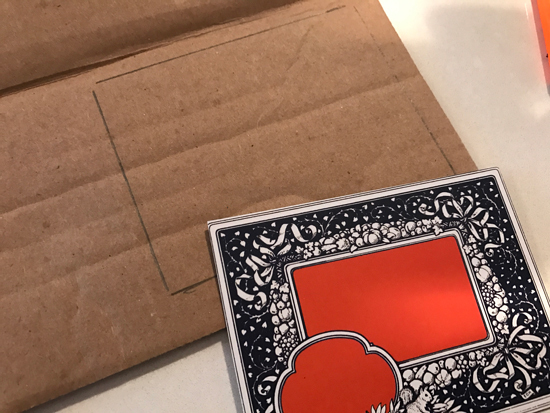 To make the card a bit more interesting, I made it dimensional by raising the Vintage Card up off the cardstock as well as bending the vellum flower away from the center. I also used the Best Glue Ever to adhere the vellum to the card -- and using the Best Glue Ever gives me an invisible hold! Here's a quick and cheap way to add dimension. All you need is a scrap piece of cardboard and the Best Glue Ever. First, take you item (here, the card) and trace around it on the cardboard, then cut it out trimming the cardboard to about 1/4" less in diameter. That way the cardboard won't show from behind your paper. 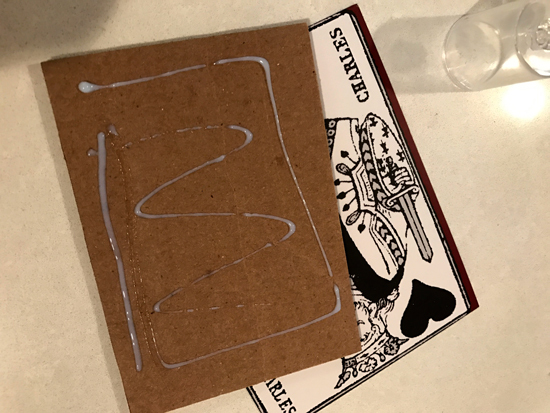 Next, all you need is a bit of the Best Glue Ever to adhere the two together before adhering the cardboard to your cardstock. I had initially planned to do the same for the silver swirl embellishment before deciding to add the vellum flower. Lisa here today to share a few mixed media cards I created using ScraPerfect's Best Glue Ever and some Robin's Nest products. I created the backgrounds on both of these cards using a white piece of textured cardstock and added strips of paper and torn washi tape. I added a thin layer of Gesso. 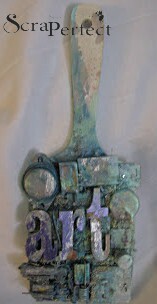 Once it was dry, I used a stencil and added light modeling paste. Finally, I added color with Gelatos and spray inks. I found that with the mixed media background, that the Best Glue Ever works very well in gluing things down. I never have to worry about it coming off once it is totally dry. I added the cards and embellishments and then matted that on black cardstock and then the white card bases that came with the Vintage Card Kit. Remember, when working with mixed media to grab some of the Best Glue Ever! 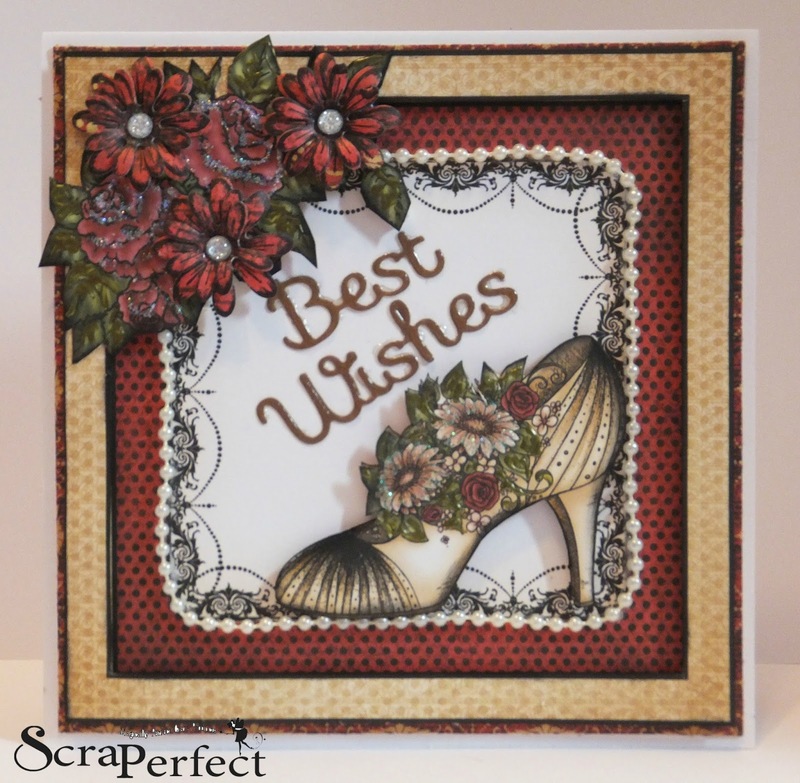 Good morning everyone, Kim here today with my next DT project for ScraPerfect. This time I have created a mixed media paint brush! I started off with a wood blank from Fernli Designs and some old computer and electronic bits from my husbands workshop. I first covered the wood blank in white gesso. pieces. As I mentioned, these are old bits from my husbands workshop that he no longer needs and I glue them down so they fit on top of the piece nicely. Once they are all glued down, I got out my Lindy's Stamp Gang and Ranger Distress Ink sprays in colours I liked and started to layer on colour, drying each layer in between. Once I was happy with the layers of colour, I got the Best Glue Ever out again, and this time I used it to glue down tiny micro, and mini micro beads for added texture to the piece. Here is a couple of close up's of the beads! I set the brush aside to dry and now I will work on the letters for the front of the brush. The letters are also wooden, and from Fernli Designs. I gave them the same spray treatment and then used BGE again so that I could use some of the Transfer Foils from ScraPerfect. Once the glue dries a bit and becomes tacky, then it is time to lay the foils down on top of the letters. I choose purple and silver foils to pick up on the colour tones on the brush. You can see in the photo below how it came out, I just love the shimmer the foils give! .....and here is the final outcome! I hope you have found some inspiration here today and will check out the ScraPerfect store for all the items I used on my project. Please check my blog http://www.angeldreamcrafts.blogspot.ca for more info. Heartfelt Creations All Glammed Up Collection and a wonderful Best Wishes card. I am having so much fun creating using my Rubber Buggy Products and ScraPerfect Best Ever Glue and many more products. Stick around to see what else I have to share. 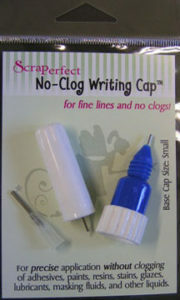 The caps for the non clog fine writing tips is amazing not just on glue... but glossy accents and stickles too. 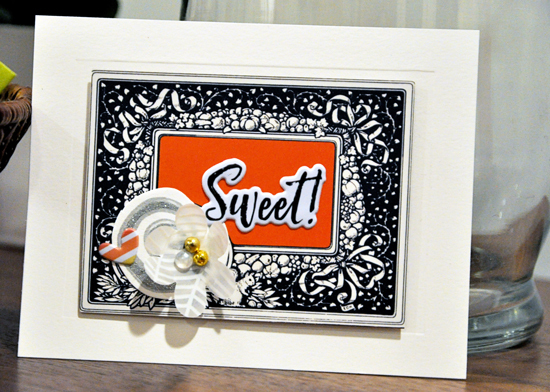 To create this card I am using the panels on some of the sheets that are designed for card making. I however never leave them totally the same. For this amazing shoe I grabbed 2 of the image that are the same... fussy cut 1 to pop up on top of the other one. Here the side view shows the pop up space between the 2 images... Ink the edges to make them pop off the page too. I also fussy cut the cluster of flowers. From the 2nd panel I also trimmed and cut the gold frame to pop up for lots of layers and dimension. On the main frame I added the die cut sentiment Best Wishes and add a run of thin pearls all around. This photo shows the pop up foam spaced around the frame ready to adhere. In the top left is an upper layer of fussy cut flower accent. After adding all the extra trims I am changing up the sentiment placement to be spaced into 2 lines. Using the fine tip makes gluing thin line words so much easier. This photo shows all my ScraPerfect non clog bottles ready to go. Glossy Accents over the thin line sentiment makes it shine. Now stickles to add glitter to the flowers on the shoe. Now I am adding Liquid pearls in green to the leaves for glitter. See the shine in the words, flowers and leaves.. it's awesome. Now some stickles for glitter on the flower cluster. From the side view you now can see lots of the layers in the frame and accents. When doing all these glue and glitter applications you often have some sticky spots but with the Perfect Crafting Pouch all you have to do is wipe it gentle across the sticky surface and it's gone. What a life saver this is! It turned out awesome.. what beautiful paper, prints, frames and accents. This photo shows the stamped, die cut and flowers made using the Deluxe Shaping kit. I then added some enamel dots to the centres. From the side you can see the floral layers. What fabulous details. Every special thing adds to the beauty of the card. Thanks for stopping by. 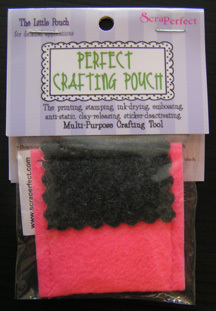 Be sure to visit the blog often to see what the rest of the DT have to share with you using these amazing products. How to STOP Inkjet Printing from Smearing! ATC Fun with ScraPerfect by Kim F.
Want to make an easy & fun Pop-Up Card?